"War! - huh- yeah-, What is it good for? Absolutely nothing, Uh-huh"
Although we must admire the sentiments in Edwin's song, in terms of creating a character for 2000AD he couldn't have been more off the mark. If your only knowledge of Rogue Trooper are the recent Gordon Rennie stories or the rambling nonsense that is the 'Friday' version, its time to become acquainted with the original G.I. and his Bio-Chips. Even if you are a battle hardened veteran of the early Rogue adventures this Graphic Novel, which collects the very early stories, is well worth having to hand. All stories are written by Gerry Finley-Day one of the unsung heroes of 2000 whose work is amongst the most talked about from 2000's early years but whose name may have been eclipsed by other writers. Artwork is Provided by artists who have all become better known for their work outside of the galaxies greatest comic; Dave Gibbons who's early visuals set the tone and standard that to this day are some of the best to grace Rogue, but when the collection also contains the names, Brett Ewins, Colin Wilson and the wonderful work of Cam Kennedy you can be assured that this book will look good from the very first page till the last. The downfall of Rogue was that his mission to find the Traitor General would one day have to come to an end. Whilst he was a wanderer with a mission the character would fight Dredd for the mantle of best 2000AD story but once that mission was achieved Rogues adventures began to lose the excitement that these early stories conveyed. "That's right-We're not going back yet." 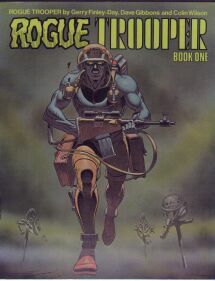 The start of this book contains 'The Making Of Rogue Trooper' from the 1983 2000AD Annual, which will give you some insight into Rogue's development. 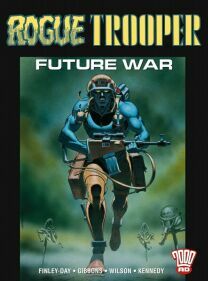 Read this book and discover why Rogue Trooper became one of the best characters 2000AD ever produced, the mix of science fiction and future war would set a precedent that 2000 would find hard to match in its attempt to create any new character in this category.